Having spotted some work in progress images shared on various instagram accounts over the last few days, Hookedblog jumped on the overland train today and heading up to Dalston in Hackney to check out the newest mural from Pixel Pancho. Not your typical Urban Artist, Pixel Pancho started painting in the streets while studying art at the Academy of Fine Arts in Valencia. "Influenced by painters such as Joaquin Sorolla and Salvador Dali, both can be seen to influence Pancho's unmistakable style being both painterly and figurative with a Dadaist twist." The italian street artist from Turin, is in town ahead of his solo show 'Memory of Our Life' opening this Thursday at StolenSpace Gallery here in East London. 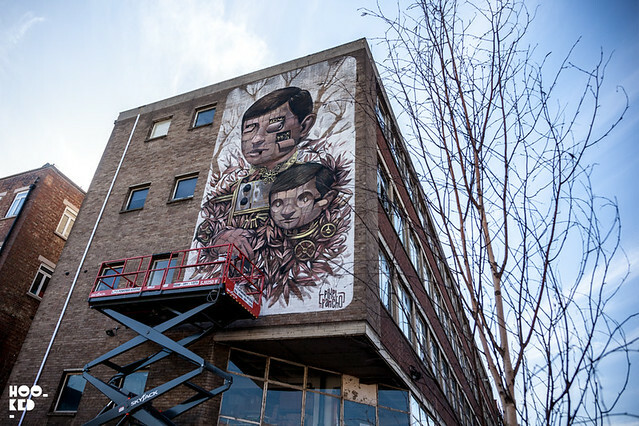 Known for his huge robot-filled murals seen across the globe, for this his first exhibition in London, Pixel Pancho will be transforming Gallery 2 at StolenSpace with an installation which is set to transport us into a surreal robotic environment. 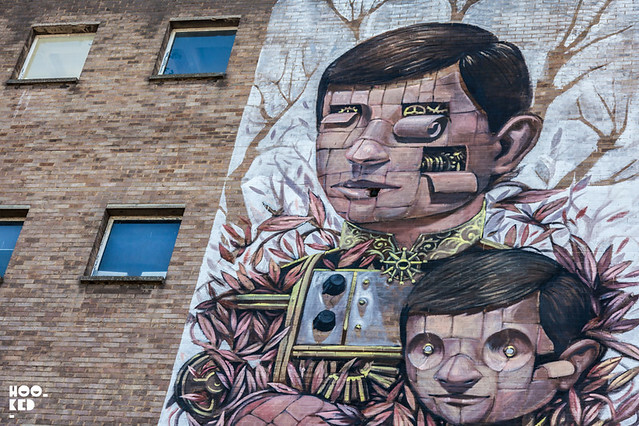 Pixel Pancho's new mural in Dalston pictured here is the first of nine murals to be painted across 3 London Boroughs, Hackney, Waltham Forest and Tower Hamlets. It is part of Colour The Capital, a new project from Forest Recycling Project who will work with 'Global Street Art' to brighten up run down community spaces with street art and murals.